$3.99 to $9.99 & FREE Shipping on orders over $59 $35. 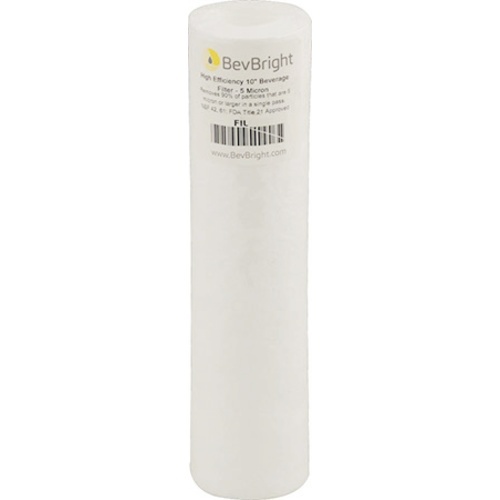 BevBright's™ one micron filters are disposable, multi-zoned, cartridge style filters perfect for filtering wine with any standard 10" filter cartridge housing. 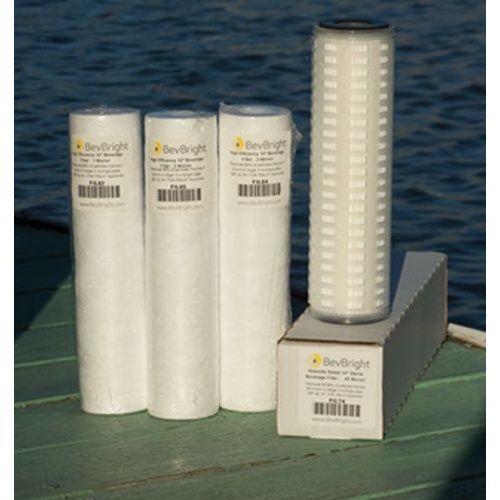 BevBright™ achieves superior efficiency by being the first to spin different diameters of poly strands on the same filter core to create zones of filtration. The zone closest to the core contains consistent, tight fibers for final filtration while the final outer layer zone is spun with larger fibers for increased sediment holding capacity and increased flow capacity. The best of both worlds. By comparison typical spun poly water filters are spun with only one size of fiber. Note that these are True 10" Filter Cartridges that rely upon the housing being closed tightly in order to engage the Knife Seals & eliminate bypass. Use a 1 micron filter for brilliant filtration when your wine has already naturally settled out. Too many yeast cells in solution or sedment at the bottom will quickly clog a 1 micron filter. Do you fear you have sediment or is your wine cloudy to the eye? Try a 3 micron or 5 micron filter. What Retention Efficiency rating should I choose? We suggest you start with the 98% Super High Efficiency rated filters and adjust from there. The efficiency rating tells you what % of material, at the given micron rating, will be filtered out in a single pass. Cheaper spun poly water filters are never rated for efficiency because they only remove 60-80% of the material at a given micron rating in a single pass. BevBright offer three levels of efficiency to fit any winemaker's budget or need. The High Efficiency rated filters work better than any 1 micron rated hardware store spun poly filters . The Super High Efficiency filters represent great value. They remove 98% of material in a single pass for just a little bit more money. Absolute rated filters are perfect for the discerning winemaker who wants to absolutely remove material 1 micron or larger. I like to filter all my beer and wine, these filters work great. Perfect for grape wines, or fruit wines that have been racked and clarified. Very good, buy just wondering is the direction of the flow important? These are great. I filter all my beers with these. Our beer comes out excellent using these filters. Does a good job of fine filtering.